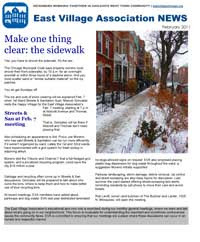 Here's the latest newsletter with news from eastvillagechicago.org. Features include a preview of Monday Feb. 7's EVA meeting with Streets & Sanitation Supt. Manuel Gonzalez; an update on preservation of St. Boniface Church, and plans for a new delicatessen restaurant on Ashland Avenue.